Robert Kerbel is currently a Senior Scientist in Molecular & Cellular Biology Research at the Sunnybrook Research Institute of the Sunnybrook Health Sciences Centre. 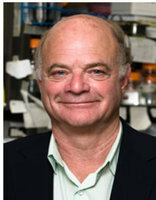 He is also a Professor of Medical Biophysics and Laboratory Medicine/Pathobiology at the University of Toronto. He is the co-Director of the Toronto Angiogenesis Center and Canada Research Chair in Tumor Biology, Angiogenesis and Antiangiogenic Therapy. He has made numerous seminal contributions to our understanding of tumor angiogenesis and antiangiogenic therapeutics. He was formerly involved in establishing and directing three different major cancer research programs in different universities and hospitals in Ontario Canada. Dr. Kerbel is the pioneer of a concept known as ‘metronomic’ chemotherapy (where chemotherapy is given at close regular intervals at low doses with no prolonged drug-free breaks) as an exciting and novel new way to combine chemotherapy with a targeted antiangiogenic drug such as bevacizumab, for the treatment of advanced metastatic disease. He has developed a number of new models of advanced metastatic disease in immune deficient mice involving human tumor cell lines, including breast, ovarian, and hepatocellular carcinoma, as well as malignant melanoma. These studies have evolved in a new research initiative, namely, the development of models of spontaneous brain metastases and their use to study the biology and treatment of such lesions. Dr. Kerbel’s group is also at the forefront of studying circulating cellular and molecular surrogate biomarkers in peripheral blood for anti angiogenic drugs and/or metronomic low-dose chemotherapy which can help determine the optimal biologic dose to be used for such drugs/treatments. Dr. Kerbel lists over 350 research papers during his career and has supervised almost 100 graduate students, postdoctoral fellows, sabbatical visitors since 1975. He is a member of the editorial board of numerous scientific journals and has given over 700 invited lectures during his career.